Description: Three-dimensional drip irrigation examples from Raij et al., 2018. 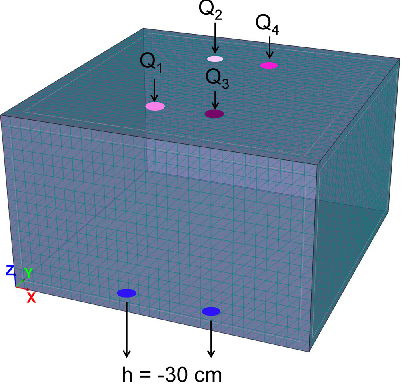 These examples demonstrate the use of the HYDRUS (2D/3D) model to study the effects of soil hydraulic conductivity and dripper discharge rate heterogeneities on lysimeter water and solute fluxes. 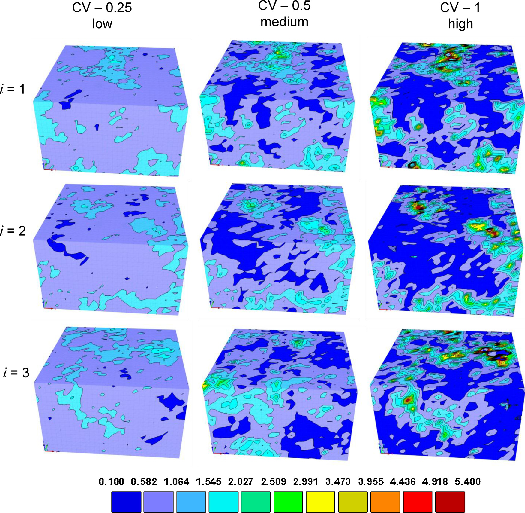 The six simulations presented here are a sample from the array of simulations used in Raij et al. (2018), where the numerical experiments are described in detail. In the Table below, a description of each simulation is presented: lysimeter size, coefficient of variation used for the generation of soil hydraulic conductivity heterogeneity (Soil), coefficient of variation used for the generation of the dripper discharge rate heterogeneity (Irr), leaching fraction (LF) and root water uptake reduction due to solute stress. 05m_Irr_0044_Soil_05LF_02 0.5 m2 lysimeter with drippers discharge heterogeneity of CV = 0.044 combined with soil hydraulic conductivity heterogeneity of CV = 0.5 and leaching fraction of 0.2 and water uptake reduction due to solute stress. 05m_Irr_0044_Soil_05LF_043 0.5 m2 lysimeter with drippers discharge heterogeneity of CV = 0.044 combined with soil hydraulic conductivity heterogeneity of CV = 0.5 and leaching fraction of 0.43. 05m_Irr_009_LF043 0.5 m2 lysimeter with drippers discharge heterogeneity of CV = 0.09 and leaching fraction of 0.43. 05m_Soil_025_LF043 0.5 m2 lysimeter with soil hydraulic conductivity heterogeneity of CV = 0.25 and leaching fraction of 0.43. 1m_Irr_002_LF043 1 m2 lysimeter with drippers discharge heterogeneity of CV = 0.02 and leaching fraction of 0.43. 1m_Soil_1_LF043 1 m2 lysimeter with soil hydraulic conductivity heterogeneity of CV = 1 and leaching fraction of 0.43. Raij, I., A. Ben-Gal, N. Lazarovitch, Soil and irrigation heterogeneity effects on drainage amount and concentration in lysimeters: A numerical study, Agric. Water Manag., 195, 1–10, doi: 10.1016/j.agwat.2017.09.012, 2018.